A leatherback sea turtle at sea. Photo courtesy NOAA. 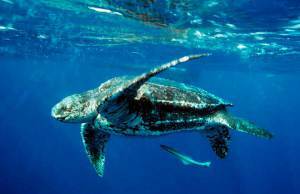 FRISCO — Threatened leatherback sea turtles like to hang out off the northeastern U.S. coast in late summer and fall, when mature jellyfish are abundant in the area, scientists said last week, sharing the results of a long-term study based on satellite data of tagged sea turtles.